There's no shortage of choice when it comes to Swift Group’s mid-market ranges; what’s more, three new models have now been added to the Swift Challenger and Sterling Eccles line-ups to bring the number of floorplans in each to nine. The layouts are the same across both ranges: it’s simply a matter of brand-styling preference. New for 2017 are two twin-axle models: the 635, with a mid-transverse washroom and transverse island bed, and the 645, also with a transverse island bed but this time featuring an end washroom. On a single axle is the 560, with a rear island bed and mid-transverse washroom. The walk-through washroom isn’t new – it’s been employed in motorhome layouts for a while – but it brought a welcome whiff of innovation to the 2016 output of caravan floorplans, and helped Lunar’s Delta RI secure our Tourer of the Year award. The major manufacturers are now introducing the feature across all range levels, so the challenge for those taking up the trend is to improve on it: Swift Group seems to have done so simply by switching the toilet and the rear transverse bed to the offside wall. This adjustment eliminates the need to carry the toilet cassette through your awning. Swift Group is also giving a boost to its entry-level and mid-market line-ups by introducing construction methods and control systems formerly only seen in the top ranges. Aluminium and plywood-constructed sidewalls are now replaced; all models will be built using the latest SMART Plus construction, which means timberless, GRP bodyshells and a new sandwich floor construction with a GRP outer skin. The new system has little effect on weight. Also being introduced across the portfolio is the Swift Command control system. It comprises an intelligent power supply unit and an LCD control panel, and can be operated remotely via an app. Our Sterling Eccles 635 test caravan was fitted with the optional Lux upgrade pack (£595), which includes an illuminated kitchen splashback, external barbecue point and 230V socket, external locker and keyfob-operated alarm system. And to see other Sterling caravans for sale, click here. New graphics in red, grey and black, a carbon fibre-effect gas locker door and chrome-effect grabhandles are enhancements to the exterior. Alongside the LED rear-lights, standard fare includes new LED numberplate, high-level-marker and brake lights. The Sterling caravan’s Al-Ko chassis has a hitch stabiliser, but ATC is an option. The black theme is carried from the hitch cover to the tinted three-piece window and panoramic sunroof, which are set in a black frame. The standard-sized steadies are easily accessible at the front, while those at the back will require a little knee-bending to locate them. The gas locker is vast, and two struts support the door. All the services are confined to the offside. At the rear you’ll find exterior access to the space beneath the fixed double bed. On the nearside are an exterior hatch to the area under the sofa, a gas-barbecue point and a mains socket. The rear of the van also features Thule bike-rack fixings. The glazed, one-piece entrance door has a sturdy handle and magnetic stay. On the inside is a lever handle that is easy to grab hold of and a waste bin. Above the entrance door are the control panels for the Swift Command and the optional Alde heating (which adds 20kg to the MiRO). The Eccles interior has a cool, sophisticated look thanks to the off-white worktops and sidewalls, and the locker doors, which are accented with a glossy graphite stripe, and chrome trim and handles. Cabinetwork is mushroom-coloured with pale, hessian accents. The thick upholstery is dressed in a silver/bronze tweed material that shouldn’t show the dirt. The parallel sofas are the same length, with square backrests, which helps when it comes to making up the second double bed. At the end of each is a bolster that’s shaped to allow for feet-up lounging. Four scatter cushions – two in a pale bronze material and two in an oyster velour – and curtains, with a silver-and-bronze leaf motif against an oyster background, provide the contrast. On the floor are loose-fit carpets. The overall effect is a clean, rather masculine look. Separating the sofas is a centre chest; it features an occasional pull-out table, two wide drawers and a locker below. Behind that is a shelf with a moulded console that’s ideal for holding your mobile phone, but sadly there are no USB points here. There are two mains electric sockets, however. The panoramic sunroof, front windows, two side windows and rooflight allow in the sunshine, although we were a little surprised that the single rooflight serves both the kitchen area and the lounge – there are two in the cheaper Sprite range. LED strips above the roof lockers, four spotlights and an LED main light above the panoramic window take care of keeping things bright at night. The moulding for the panoramic window incorporates the main light and a speaker on either side. The kitchen isn’t particularly large, but has everything you need. The Thetford Aspire 2 cooker with dual-fuel hob, and separate oven and grill with spark ignition, sits to the right-hand side. Next to that is a circular off-white plastic sink, with a chrome-effect mixer tap and a detachable drainer. Placing these elements next to each other frees up worktop space to the left; it’s not vast, and there’s no glass cover for the sink, but there is a sizeable extension flap should you require more preparation space. Above the sink is a built-in microwave oven set between two spacious wall cupboards. Our example was fitted with the optional Lux pack, so the kitchen window was surrounded by an attractive illuminated splashback. The cupboards under the worktop are in contrasting graphite grey and, with the slimline Dometic three-way fridge/freezer positioned opposite, there are plenty of them. Under the sink is a deep drawer with a moulded tray for utensils; below that is a cupboard with a slide-out chrome rack for vegetables or tins. The gas taps are also in here. Directly beneath the worktop are a slim cutlery drawer and a shelved cupboard. There’s a single mains socket, plus a pair of light switches. The black-fronted fridge, which has a removable freezer section, features a deep locker above and below. To its left is a tall unit that accommodates the freestanding table, and more shelving. On the other side of the fridge is a useful shelved cupboard and there’s a TV bracket above the worktop, with 12V, mains and TV-aerial points. Higher up there’s a handy small cubbyhole for keys and other smaller items. A domestic-style door separates the washroom from the living space, and a single sliding door separates it from the bedroom. Walking through from the kitchen, you’ll find a large wardrobe to the left. Alongside is a small, shelved cupboard – handy for toilet rolls – with two shelves above. There’s a Thetford swivel cassette toilet with electric flush, above which is a frosted window. Although there is a rooflight, the washroom is quite dark; it might have benefited from a larger window at the expense of the shelves. Above the window is a shallow cupboard. The central location of the vanity unit, with its large mirror, is useful: with the door to the living space open, you get almost a full-length view of your outfit. The unit comprises an oval basin and chrome-effect mixer tap set in a narrow surround; below is a shelved cupboard. The mirror is backlit on either side, dressing-room- style, by LED strips. There are five LEDs in panels around the washroom. The weakest element of the mid-transverse washrooms that we’ve seen is the shower. The Sterling Eccles 635’s is semi-circular and fully lined, with LED lighting and an EcoCamel showerhead; however, it’s small and the wheelarch intrudes – which is also the only place to put toiletry bottles. If you drop the soap, you may have to open the shower door to get room to bend down and retrieve it. An Alde radiator with a towel ring above is conveniently placed next to the shower, and there are two hooks on the shower wall. There’s plenty of room to get dressed in here: it’s certainly a well-thought-out and practical space. “Wow!” was our reaction to the Sterling Eccles 635’s end bedroom. The space feels uncluttered by furniture because the transverse bed isn’t hemmed in by wardrobes – the sole wardrobe is in the washroom; instead there are bedside cabinets taking up the equivalent floor space. The trio of drawers in each aren’t very wide, but they are long. There’s plenty of space for books and so on. Above the bed are three shelved lockers for clothes. The bed has a thick Duvalay mattress with an infill, so that it can be pushed back during the day to create more space. This arrangement also allows space in the nearside corner for a vanity unit, with a mirrored cupboard above. Here there are 12V, mains and TV-aerial sockets; a television-mounting bracket is to the left of the nearside window. There’s a socket for a hairdryer, and a larger corner cupboard. The space is well-lit, too. There’s a window on the rear wall and the nearside; they’re surrounded by padded panels in the same material as the lounge curtains. The panels serve as decoration and work very well. There’s also a small rooflight. At night you can go for ambient lighting from the over-locker LED strips, reading lights from the two spots or illumination from above the vanity unit. Vents running at low level along the nearside and end walls provide warmth from the Alde central heating. The bed in the lounge, meanwhile, is made up by pulling the slats from beneath the front chest and simply rearranging the cushions. Space in the lounge’s offside seat base is inevitably taken up by the boiler for the Alde central heating and the consumer unit, but this has been arranged so that there is some room for stowing a little of your touring kit, too. Aside from the alarm, the nearside sofa base is free from clutter. The single roof lockers on either side aren’t shelved, to allow access to the corner cubbies; the area might have been better left as open shelves. There are plenty of cupboards in the kitchen for crockery, saucepans and groceries, and the pull-out wire storage basket is useful. Two or three days’ perishables can be stored within that tall fridge/freezer. The wardrobe is a good size, with plenty of hanging space and two useful shelves on the bulkhead with the kitchen. There’s also a shelf below, above the wheelarch. It’s a neatly designed area. Overall, storage in the washroom is pretty good: there’s a shallow cupboard below the basin, one over the toilet and a small one to the side of the Thetford loo. There is also a small shelf located above the Alde radiator here. The bed sits on a rather unattractive plastic moulded bed base that, thankfully, you don’t notice unless you lift the mattress to access the space below. The spare wheel is stored in this space, but there’s room to stow outdoor chairs and other bulky items, and exterior access to the area is also available. Incidentally, there’s a handy mains socket on either side of the base, too. So, what do we make of the Sterling Eccles 635? Having a washroom across the centre of the van makes so much sense: those using the make-up bed in the lounge don’t have to pass those in the fixed bed to use the facilities, and you also get the impression of proper ‘rooms’. 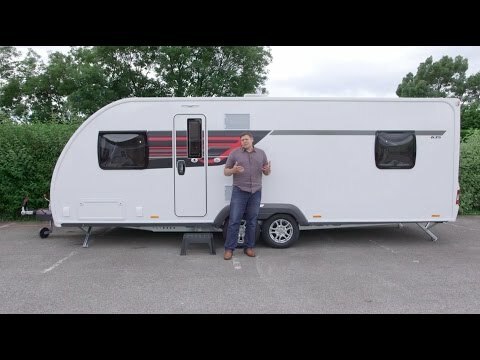 The lack of ATC trailer control and USB points is disappointing in a mid-market caravan, but take up all the available options and you’ll get a very comfortable tourer that would also work well as a seasonal-pitch caravan.